Hyundai Ioniq 1.6 GDi Plug-in Hybrid Premium SE 5dr DCT 2019 Review | What Car? 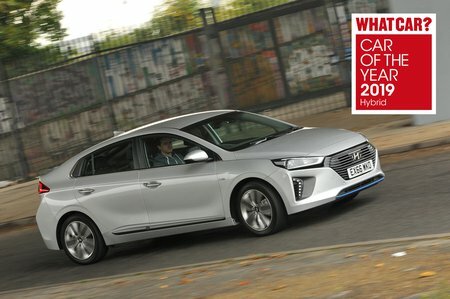 The hybrid version of the Hyundai Ioniq is a credible alternative to its rivals, with the plug-in hybrid offering an even more useable and economic option for eco-friendly drivers. It does well to compete against the Toyota Prius class-leader, with a plusher interior and strong performance even on undulating roads. The electric-only version is not so convincing, though, due to its bigger batteries that make the car heavier and restrict boot space. Premium SE trim starts to look a bit pricey, but if you love your luxuries there’s leather, electrically adjustable and ventilated front seats, heated rear seats and front parking sensors. There’s also additional safety features, including blindspot monitoring and a rear cross-traffic alert, which halts the car if you are about to reverse in to something. In town, the Plug-in Hybrid will start off on electric power alone, making it whisper-quiet. You need to tread gingerly on the accelerator to avoid the petrol engine cutting in, but when it does the transition is smooth – the only tell-tale sign being some background engine thrum. It’s disappointing, though, that even after selecting pure-EV mode on the plug-in model its engine cuts in on anything more than a slight incline.